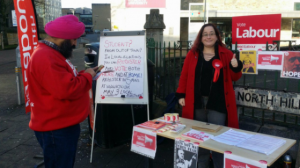 Earlier today a group of Labour activists, campaigning right outside Plymouth University, urged passing students to vote twice (presumably on the basis that students are more likely to support Labour). 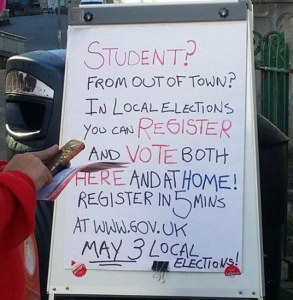 They displayed a poster which read “In local elections you can register and vote both here and at home”, with the “and” underlined (see photo above). It’s worth noting that this isn’t illegal. 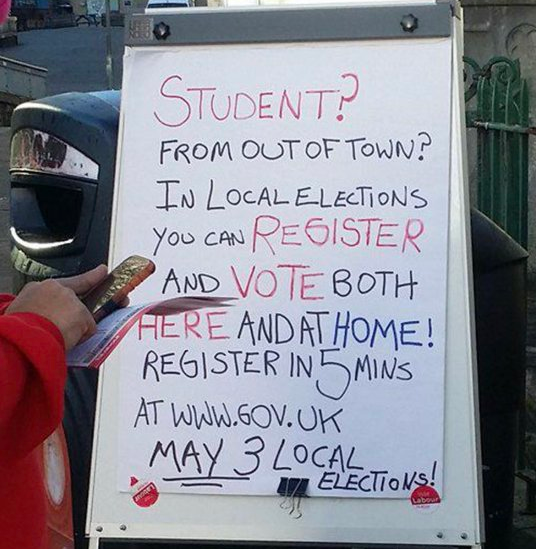 Whilst it’s a criminal offence to vote in more than one constituency in a General Election, the same doesn’t apply to local elections and students can theoretically register and vote twice (at both their university address and home address). But is it in any way moral or democratic? Should the Labour Party really be encouraging people it believes to be its supporters to vote twice based on a legal loophole? We’ll let you be the judge of that.